A desperate gambler, in a financial hole, isn't trying to win, really. It's not that simple for him. He needs to win just enough so he can break even with the looming debts in his head, and then the slate will be wiped clean and he can walk away with a clear conscience. But! Once he beats the odds and actually wins just enough to break even, the siren call starts up again: Why not keep going? An hour ago you were a loser. Now you're a winner. And we all know how that ends. Knowing how it all ends is the main problem with a lot of gambling movies, and "Win It All" is no exception. In the third collaboration between Joe Swanberg and Jake Johnson ("Drinking Buddies," "Digging for Fire"), chronic loser Eddie (Johnson) tries to get his act together, encouraged by his long-suffering brother, his Gamblers Anonymous sponsor, and a new romantic interest. Eddie doesn't have a job. He plays poker at night. He's always strapped for cash. From the way his brother Ron (Joe Lo Truglio) treats him, you can tell that Eddie has always been a problem, the guy who needs a loan, the guy with grandiose unrealistic plans, the guy who can't settle down. The inciting incident of "Win It All" occurs when a scary gangster-type named Michael (José Antonio García) asks Eddie to hold onto a duffel bag for him while he does a stint in prison. He'll pay Eddie $10,000 just for keeping the bag safe. However: Eddie is not allowed to look in the bag. Eddie agrees to this condition, assuming it will be the easiest money he ever made. Michael has to know that Eddie will not be able to resist looking in that bag, right? Michael has to know that if, for example, there happened to be wads of cash in that duffel bag, then leaving it in Eddie's care would be the same thing as throwing the money away? "Win It All" proceeds in a pretty predictable fashion (mainly because gambling proceeds in a predictable fashion). This is a story we all know already. Good movies about gambling ("The Hustler," "The Gambler," "California Split," "The Sting," "The Cooler," to name a few) deal with high-stakes pressure, the mindset of gamblers, the magical thinking involved (and required). To someone who has no interest in gambling, there's something queasily awful about watching someone not know to quit while they're ahead. 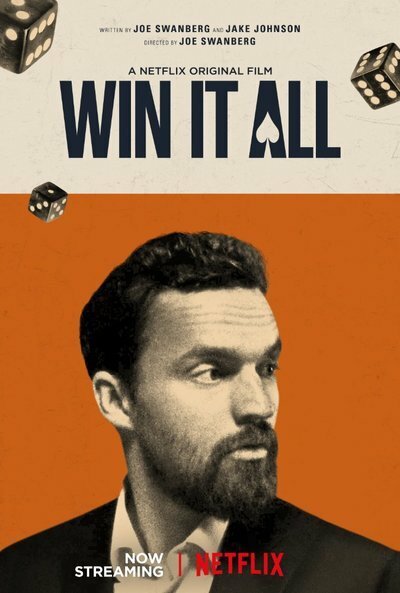 "Win It All" has a couple of entertaining sequences with an improvisatory spontaneity that—when it works—is the best part of Swanberg's low-key style. But overall, the film feels very slight, wispy-thin, barely there. "Win It All" also has an extremely obtrusive soundtrack, but the music can't create the urgency that the film really needs. Eddie is such a hapless loser that throughout the film, you side with those who caution Eddie to stop gambling. There's his brother, who gets him a job in the family landscaping business. Eddie actually starts to enjoy the work. Then, on a night out carousing with friends, he meets Eva (Aislinn Derbez). Eddie is at his charming expansive best that night, and she's attracted to him. Eva's a nurse and a single mother. She leads a serious life and is cautious about whom she allows into it. But Eddie makes her laugh. He's a gentleman. He's inspired to get his act together because of her. There's no teeth in any of this. "Win It All" flops around in generalities. The best scenes are Eddie's meet-ups with his GA sponsor Gene, played by Keegan-Michael Key as perhaps the worst "sponsor" in the history of sponsors. Eddie tells him his struggles, and Gene bursts out laughing. He calls Eddie an "idiot" over and over again. Later in the film, he makes a suggestion so inappropriate that you can tell that Gene is on the edge of a relapse himself. Key was wonderful in last year's "Don't Think Twice" as the improv comedian who made it big, and here he's hilarious, bold, specific. These scenes spark with an unpredictability and energy that many of the other scenes lack. For the high stakes involved, "Win It All" feels strictly low stakes.